Several months before March 1699, Guru Gobind Singh invited his followers from all over India to a special congregation at Anandpur on Vaisakhi Day, 30 March 1699. As a result, on that particular day many hundreds of devotees and onlookers had gathered at Anandpur Sahib. Many had come as a sign of respect for the Guru and in accordance to his invitation while some had just come out of curiosity. On the appointed day, the Guru addressed the congregants with a most stirring oration on his divine mission of restoring their faith and preserving Dharam (righteousness). After his inspirational discourse, he flashed his unsheathed sword and said that every great deed was preceded by equally great sacrifice. He asked, with a naked sword in his hand, “I need one head. Is there anyone among you, who is ready to die for his faith?” When people heard his call, they were taken aback. Some of the wavering followers left the congregation, while other began to look at one another in amazement. After a few minutes, a brave Sikh from Lahore named Daya Ram stood up and offered his head to the Guru. The Guru took him to a tent pitched close by, and after some time, came out with a blood dripping sword. The Sikhs thought Daya Ram had been slain. The Guru repeated his demand calling for another Sikh who was prepared to die at his command. At this second call, even more people were shocked and some were frightened. A few more of the wavering followers discreetly began to filter out of the congregation. However, to the shock of many, another person stood up. The second Sikh who offered himself was Dharam Das. This amazing episode did not end there. Soon three more, Mohkam Chand, Sahib Chand and Himmat Rai, offered their heads to the Guru. Each Sikh was taken into the tent and some though that they could now hear a ‘thud’ sound – as if the sword was falling on the neck of the Sikh. Now the five Sikhs were missing with the Guru in the tent. It was a nerve-racking time for the sangat (congregation). There was pin-drop silence as all focussed intensely on the tent opening. After what seemed an eternity, the tent opening moved and the Guru came out of the tent. No naked sword this time! Upon administering amrit to the Five Beloved Ones (Panj Pyare), the Guru asked them to baptize him in the same manner, thus emphasizing equality between the Guru and his disciples. Guru Gobind Singh named the new ceremony, Khande di Pahul, namely the baptism of the double-edged sword, which is also known as Amrit-Sanchar. He stirred water in an iron bowl with the sword, reciting five major compositions, Japji, Jaap, Savaiyye, Benti Chaupai and Anand Sahib, while the five Sikhs stood facing him. The Guru’s wife, Mata Sahib Kaur put some sugar-puffs into the water. The nectar thus obtained was called “Khanday-da-Amrit” or simply just “Amrit“. This implied that the new Khalsa brother-hood would not only be full of courage and heroism, but also filled with humility. The creation of Khalsa marked the culmination of about 240 years of training given by the ten Gurus to their Sikhs. The Guru wanted to create ideal people who should be perfect in all respects, that is a combination of devotion (Bhakti) and strength (Shakti). He combined charity (Deg) with the sword (Tegh) in the image of his Sikh. 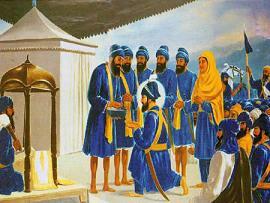 The Khalsa was to be a saint, a soldier and a scholar, with high moral and excellent character. He or she would be strong, courageous, learned and wise. In order to mould his personality the Guru inculcated in him the five virtues – sacrifice, cleanliness, honesty, charity and courage, and prescribed a Rehat – the Sikh code of discipline. His character would be strengthened by the spirit of God revealed in the Guru’s hymns. For this purpose he was asked to recite the five sacred composition or Banis daily. The combination of virtue and courage is the strength of the Khalsa. This is an assurance against the ruthless exploitation of masses by their masters, and a device for overcoming hurdles that lied in the practice of holiness and spiritualism in daily life. 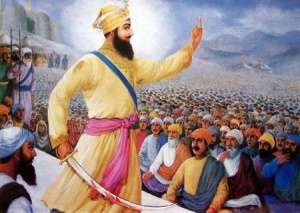 Guru Gobind Singh commanded the Khalsa to use the sword only in times of emergency, that is, when peaceful methods failed and only for self-defence and the protection of the oppressed. His spirit will continue to inspire them for the preservation of peace, order and dignity of mankind for all time to come.